The HIB vaccine is solely for capsulated Haemophilus B, not non encapsulated Hib. The HIB vaccine is solely for invasive Hib disease caused by capsular Hib. It has no effect on any other type of Hib disease. You can’t make a Hib vaccine for non-encapsular HIB. Due to the recommended and rountine use of Hib conjugate vaccine, at least half of invasive H influenzae infections are now caused by the nonencapsulated strains. There are six strains of H. influenzae that have been classified (types a through f) and other non-typeable strains. Type b is responsible for 95 percent of all strains causing invasive disease. Invasive Hib disease usually manifests itself clinically as meningitis, accounting for 50 to 65 percent of all cases. PedvaxHIB® [Merck] [Haemophilus b Conjugate Vaccine (Meningococcal Protein Conjugate)] PedvaxHIB* [Haemophilus b Conjugate Vaccine (Meningococcal Protein Conjugate)] is a highly purified capsular polysaccharide (polyribosylribitol phosphate or PRP) of Haemophilusinfluenzae type b (Haemophilus b, Ross strain) that is covalently bound to an outer membrane protein complex (OMPC) of the B11 strain of Neisseria meningitidis serogroup B. Each 0.5 mL dose of Liquid PedvaxHIB is a sterile product formulated to contain: 7.5 mcg of Haemophilus b PRP, 125 mcg of Neisseria meningitidis OMPC and 225 mcg of aluminum as amorphous aluminum hydroxyphosphate sulfate (previously referred to as aluminum hydroxide), in 0.9% sodium chloride, but does not contain lactose or thimerosal. ActHib [sanofi pasteur] The vaccine consists of the Haemophilus b capsular polysaccharide (polyribosyl-ribitol-phosphate, PRP), a high molecular weight polymer prepared from the Haemophilus influenzae type b (HiB) strain 1482 grown in a semi-synthetic medium, covalently bound to tetanus toxoid.1 The lyophilized ActHIB vaccine powder and saline diluent contain no preservative. The tetanus toxoid is prepared by extraction, ammonium sulfate purification, and formalin inactivation of the toxin from cultures of Clostridium tetani (Harvard strain) grown in a modified Mueller and Miller medium. The PRP-OMPC conjugate is prepared by the chemical coupling of the highly purified PRP (polyribosylribitol phosphate) of Haemophilus influenzae type b (Haemophilus b, Ross strain) to an OMPC of the B11 strain of Neisseria meningitidis serogroup B. The coupling of the PRP to the OMPC is necessary for enhanced immunogenicity of the PRP. This coupling is confirmed by analysis of the components of the conjugate following chemical treatment which yields a unique amino acid. After conjugation, the aqueous bulk is then adsorbed onto an amorphous aluminum hydroxyphosphate sulfate adjuvant (previously referred to as aluminum hydroxide). polyribosylribitol phosphate, isolated from Haemophilus b strain Eagan grown in a chemically defined medium (a mixture of mineral salts, amino acids, and cofactors). utilize different carrier proteins. Two combination vaccines that contain Hib conjugate vaccine are also available. Provoked Hib in rats (by causing transient immune suppression for 7 – 14 days) and also in humans. The polysaccharide vaccine was quietly swept under the rug. It continued to be used after 1987, but was rapidly replaced with the conjugate vaccine. In 1985, the first Hib polysaccharide vaccines were licensed for use in the United States. These vaccines contained purified polyribosylribitol phosphate (PRP) capsular material from the type b serovar. Antibody against PRP was shown to be the primary component of serum bactericidal activity against the organism. PRP vaccines were ineffective in children less than 18 months of age because of the T-cell-independent nature of the immune response to PRP polysaccharide. Conjugation of the PRP polysaccharide with protein carriers confers T-cell-dependent characteristics to the vaccine and substantially enhances the immunologic response to the PRP antigen. In 1989, the first Hib conjugate vaccines were licensed for use among children 15 months of age or older. In 1990, two new vaccines were approved for use among infants. Conjugation is the process of chemically bonding a polysaccharide (a somewhat ineffective antigen) to a protein “carrier,” which is a more effective antigen. This process changes the polysaccharide from a T-independent to a T-dependent antigen and greatly improves immunogenicity, particularly in young children. In addition, repeat doses of Hib conjugate vaccines elicit booster responses and allow maturation of class-specific immunity with predominance of IgG antibody. The Hib conjugates also cause carrier priming and elicit antibody to “useful” carrier protein. The first Hib conjugate vaccine (PRP-D, ProHIBIT) was licensed in December 1987. This vaccine was not consistently immunogenic in children younger than 18 months of age. PRP-D is no longer available in the United States. Haemophilus influenzae is a small, nonmotile Gram-negative bacterium in the family Pasteurellaceae, on the level with the Vibrionaceae and the Enterobacteriaceae. The family also includes Pasteurella and Actinobacillus, two other genera of bacteria that are parasites of animals. Encapsulated strains of Haemophilus influenzae isolated from cerebrospinal fluid are coccobacilli, 0.2 to 0.3 to 0.5 to 0.8 um, similar in morphology to Bordetella pertussis, the agent of whooping cough. Non encapsulated organisms from sputum are pleomorphic and often exhibit long threads and filaments. The organism may appear Gram-positive unless the Gram stain procedure is very carefully carried out. Furthermore, elongated forms from sputum may exhibit bipolar staining, leading to an erroneous diagnosis of Streptococcus pneumoniae. Seven serotypes of the bacterium have been identified on the basis of capsular polysaccharides. Until the implementation of widespread vaccination programs, type b H. influenzae was the most common cause of meningitis in children between the ages of 6 months and 2 years (see Figure 4 below), resulting in 12,000 to 20,000 cases annually in the U.S. It would be interesting to view comparative data since the era of vaccination against H. influenzae meningitis, which began in 1985. Certainly, there are fewer than 100 cases annually of bacterial meningitis caused by H. influenzae type b. *bloggers note..type g has since been identified. Despite nearly complete vaccine coverage, a small number of fully vaccinated children in the Netherlands have experienced invasive disease caused by Haemophilus influenzae serotype b (Hib). This increase started in 2002, nine years after the introduction of nationwide vaccination in the Netherlands. The capsular polysaccharide of Hib is used as a conjugate vaccine to protect against Hib disease. To evaluate the possible rise of escape variants, explaining the increased number of vaccine failures we analyzed the composition of the capsular genes and the expressed polysaccharide of Dutch Hib strains collected before and after the introduction of Hib vaccination. Haemophilus influenzae is a common pathogen, especially among children, but the clinical manifestations are largely type specific. The encapsulated H. influenzae serotype b (Hib) usually causes invasive infections, such as meningitis and septicemia (2), whereas the much more common nonencapsulated, or nontypeable, H. influenzae (NTHi) is a major cause of otitis media, sinusitis, and pneumonia (8). General vaccination against Hib has reduced the incidence of Hib infection to a near minimum (10), while attempts to construct a vaccine against the costly NTHi infections have as yet been unsuccessful due to a high genetic heterogeneity among NTHi strains. Federal health officials are urging doctors and state agencies to be more careful in suspected cases of invasive Haemophilus influenzae type B (HiB) in children younger than 5, largely due to a continuing vaccine shortage that is expected to continue until the middle of 2009. The vaccine protects against Hib disease (Haemophilus influenza type b) a bacterium estimated to be responsible for some three million serious illnesses and an estimated 386,000 deaths every year, mainly through meningitis and pneumonia. There are varying forms of serotypes of H. influenzae, says Michael Jackson, an epidemiologist with the U.S. Centers for Disease Control and Prevention (CDC). The current vaccine helps to prevent type B, at one time the most common cause of bacterial meningitis in children. But the reporting of serotypes to the CDC has been inconsistent with an estimated 40 percent of cases lacking such information, Dr. Jackson said. The vaccine shortage began in December 2007 when Merck recalled 1.2 million doses of the vaccine. The voluntary recall began after the Merck found a bacterial contamination, Bacillus cereus on vaccine manufacturing equipment at its Pennsylvania plant. The company has recently modified its manufacturing process, delaying vaccine availability until the middle of next year, said a spokeswoman for Merck. While there is enough Hib vaccine to supply infants with a first series of shots, the shortage means children are going longer without the booster shots usually given after their first birthday, said CDC officials. Agency officials encourage state and hospital laboratories, health departments and doctors to do serotyping of blood or spinal fluid specimens in a timely manner and report findings to the CDC. 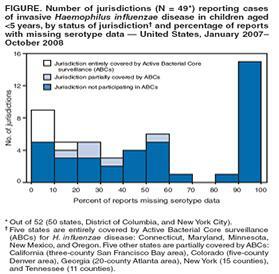 The full report is published in the CDC’s weekly MMWR report on November 21, 2008. ActHib and OmniHib are conjugated with tetanus toxoid. Hib Titer is conjugated with mutant diphtheria protein. PedvaxHib and Comvax are conjugated with meningococcal group B outer membrane protein. Efficacy? The information varies based on the brand of vaccine. Table 2 at the end of this page http://www.cdc.gov/mmwr/preview/mmwr…m#00001680.htm tells how effective each dose number is. Results of efficacy trials among infants are available for the three conjugate vaccines. The first efficacy trial of an Hib conjugate vaccine among infants was completed in Finland using the PRP-D vaccine. In a systematic, unblinded trial involving 60,000 infants (30,000 of whom received the vaccine at 3, 4, and 6 months of age), the point estimate of efficacy was 87% (95% CI = 50%-96%) (10). In a randomized, double-blind, placebo-controlled study of 2,102 Alaskan Natives, however, the point estimate of efficacy was 35% (95% CI = (-57%)-73%) (11). Immunogenicity of the vaccine was limited in both trials. In the Finnish trial, less than 40% of infants had attained an antibody level of greater than 1 ug/mL 1 month after receiving the third of three doses (geometric mean titer (GMT) = 0.42 ug/mL). In Alaska, infants with a similar vaccination schedule had lower mean titers (GMT = 0.2 ug/mL) 3 months after receiving the third dose. A subsequent immunogenicity study documented antibody responses that were similar to those in the Alaskan and Finnish efficacy trials. In a randomized, double-blind US clinical trial, ActHIB® was given concomitantly with DTP to more than 5,000 infants and Hepatitis B vaccine was given with DTP to a similar number. In this large study, deaths due to sudden infant death syndrome (SIDS) and other causes were observed but were not different in the two groups. In the first 48 hours following immunization, two definite and three possible seizures were observed after ActHIB® and DTP in comparison with none after Hepatitis B vaccine and DTP. This rate of seizures following ActHIB® and DTP was not greater than previously reported in infants receiving DTP alone. (Refer to product insert for AvP DTP.) Other adverse reactions reported with administration of other Haemophilus b conjugate vaccines include urticaria, seizures, hives, renal failure and Guillain-Barré syndrome (GBS). A cause and effect relationship among any of these events and the vaccination has not been established. Children are at more risk of getting Hib disease right after vaccination. Studies from Science News warn of increased susceptability to the disease during the first 7 days after vaccination. The AAP has warned doctors to look for signs of the disease following vaccination (AAP policy statement.) Several studies have found that that Hib vaccinated children are up to 6 times more likely than non Hib vaccinated children to contract Hib during the first week following vaccination. (Pediatric Infectious Disease Journal and JAMA). Who are the highest risks? Thirty-two percent of children aged 6–59 months with confirmed type b disease had received three or more doses of HIB vaccine, including 22 who had received a booster dose 14 or more days before onset of their illness. The cause of Hib vaccine failure in these children is not known. The British Medical Journal warns about the dangers of childhood vaccines. Investigators pooled data on roughly 116,000 Finnish children who received Heamophisis Influenza type b vaccine at either 3 or 24 months of age. These children were compared with 128,5000 children who did not receive the vaccine. Subjects were reevaluated at age 10. The study’s author found that “immunizations starting after the age of 2 months is associated with an increased risk of diabetes. Our analysis is further associated with a similar rise in diabetis after immunization with H influenzae type b vaccine in the US and UK. Furthermore, the increased risk of of diabetes in the vaccinated group exceeds the expected decreased risk of complication of H influenzae meningitis. The Hib vaccine can cause adverse reactions such as convulsions, allergic reactions such as anaphylaxis, vomiting, and serum sickness-like reactions. The FDA did not recognize these reactions when licensure was granted. Incidence of Hib type meningitis peaks between 6-11 months. Milstien JB, Gross TP, Kuritsky JN Adverse reactions reported following receipt of Haemophilus influenzae type b vaccine: an analysis after 1 year of marketing Pediatrics 1987 (Aug); 80 (2): 270-274. The “Finnish” study, upon which license was granted, showed the vaccine was ineffective for infants 3-17 months of age. Peltola H, Kayhty H, Sivonen A, Makela H Haemophilus influenzae type b capsular polysaccharide vaccine in children: a double-blind field study of 100,000 vaccinees 3 months to 5 years of age in Finland. Pediatrics 1977 (Nov); 60 (5): 730-737. Ward JI, Broome CV, Harrison LH, Shinefield H, Black S Haemophilus influenzae type b vaccines: lessons for the future Pediatrics 1988 (Jun); 81 (6): 886-893. Osterholm MT, Rambeck JH, White KE, Jacobs JL, Pierson LM, Neaton JD, Hedberg Lack of efficacy of Haemophilus b polysaccharide vaccine in Minnesota JAMA 1988 (Sep 9); 260 (10): 1423-1428. The C.D.C. stated “Efficacy of the conjugate vaccine (currently being used) has not been determined in field trials. MMWR 1988, Vol. 37, RR-37, pp. 13-16. Your baby will actually become more susceptible to meningitis for up to 3 weeks following vaccination. Daum RS, Sood SK, Osterholm, MT et. al. Decline in serum antibody to the capsule of Haemophilus influenzae type b in the immediate postimmunization period. J Pediatr. 1989 (May); 114 (5): 742-747. Sood SK, Schreiber JR, Siber GR, Daum RS. Postvaccination susceptibility to invasive Haemophilus influenzae type b disease in infant rats. J Pediatr 1988 (Nov); 113 (5): 814-819. Hiner EE, Frasch CE Spectrum of disease due to Haemophilus influenzae type b occurring in vaccinated children. J Infect Dis 1988 (Aug); 158 (2): 343-348. Granoff DM, Shackelford PG, Suarez BK, Nahm MH et. al. 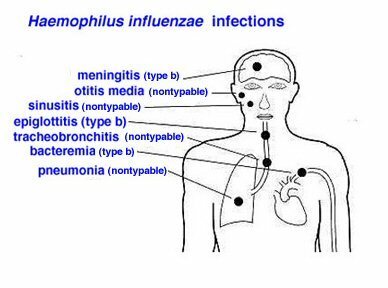 Hemophilus influenzae type B disease in children vaccinated with type B polysaccharide vaccine. N Engl J Med 1986 Dec 18;315(25):1584-1590. Ward J Newer Haemophilus influenzae type b vaccines and passive prophylaxis. Pediatr Infect Dis J. 1987 (Aug); 6 (8): 799-803. The risk of contracting meningitis one week after vaccination is 6.4-1.8 times greater than unvaccinated children. Sood SK, Schreiber JR, Siber GR, Daum RS Postvaccination susceptibility to invasive Haemophilus influenzae type b disease in infant rats J Pediatr 1988 (Nov); 113 (5): 814-819. 41% of cases of Hib occurred in vaccinated individuals. The vaccine’s protective efficacy is about negative 58%. You are more likely to get Hib if you are vaccinated. Osterholm MT, Rambeck JH, White KE, Jacobs JL, Pierson LM, Neaton JD, Hedberg Lack of efficacy of Haemophilus b polysaccharide vaccine in Minnesota. JAMA 1988 (Sep 9); 260 (10): 1423-1428. The widespread use of the Hemophilus influenza vaccine in 1986 was followed by a 62% rise (16 cases/100,000 children to 29.2 cases/100,000) in the incidence of diabetes in the 0-4 age group between the years 1980-1982 and 1990-1992. Tuomilehto J, Virtala E, Karvonen M, Lounamaa R, Pikaniemi J et. al. Increase in incidence of insulin-dependent diabetes mellitus among children in Finland Int J Epidemiol 1995 (Oct); 24 (5): 984-992. The incidence of IDDM also rose in the young children 2-3 year olds after the first dose of HiB was introduced. Classen DC, Classen JB The timing of pediatric immunization and the risk of insulin-dependent diabetes mellitus Infectious Diseases in Clinical Practice 1997; 6: 449-454. Drastic rises in the incidence of IDDM have been reported in the US and the UK after the introduction of the HiB vaccine. An epidemic of diabetes in the 0-4 age group occurred during the years 1985-1989 in Allegheny County at the time when the Hemophilus influenza vaccine was being incorporated into the immunization schedule. The annual incidence of IDDM in 0-4 year olds living in Allegheny county rose 60% from the years 1980-1984 (10 cases/100,000) to 1985-1989 (16 cases/100,000). The incidence of diabetes in 0-4 year olds had been consistently below 10 cases/100,000 from 1965-1984. The incidence of IDDM in this age group is expected to rise even higher since the maximum effect of the HiB vaccine on IDDm is not seen until 4 years after immunization. Dokheel TM An epidemic of childhood diabetes in the United States? Evidence from Allegheny County, Pennsylvania. Pittsburgh Diabetes Epidemiology Research Group Diabetes Care 1993 (Dec); 16 (12): 1606-1611. Brewster D. The epidemiology of Haemophilus influenzae invasive disease in Scotland prior to immunisation. Health Bull (Edinb) 1993 (Nov); 51 (6): 385-393. Hib and E Coli are not killers in undeveloped countries because the people can’t afford antibiotics. When you use antibiotics, the gut flora becomes unbalanced and causes E. Coli numbers to explode; making them very dangerous. Antibiotics kill E.Coli, and by doing so, can kill. The bacterial cell walls become endotoxin which cannot be processed by the liver and thus the person dies from antibiotic-induced endotoxic shock. Since 70% of the immune system resides in the gut, if you use antibiotics too much, not only do you create imbalances, you also create situations where you wouldn’t get good levels of diverse ‘good’ flora, so that they can make good levels of immunity to Hib. Hib is a bacteria that lives in our upper respiratory tract and stomach. By the time most children are 5 years old, they have had HIB. The majority will not get meningitis or any other serious disease. The HIB vaccine was invented for capsulated Haemophilus B. The HIB vaccine is only for invasive Hib disease caused by capsular Hib. It will have no effect on non-encapsulated Hib. Fully breast fed children are protected against Hib. Breast milk provides a full spectrum of commensal bacteria and primes the immune system in the right way. Good commensal bacteria allow a child to develop natural immunity to Hib and to other meningitis types. The vaccine may make a specific immunity to one type, but then you have may have destroyed broad spectrum immunity. This might leave the child susceptible to the other types they were naturally immune to before. HIB was on the decline in the 1980’s, before a vaccine was recommended for use. Just as the CDC states in the Pink Book, the incidence rate was not due to the vaccine because the lower incidence rate occurred at the same time the vaccine was licensed and before the vaccine was introduced. The first two conjugate vaccines licensed for use in 1987, along with the earlier polysaccharide Hib vaccine in 1985, are no longer used. Some of the HIB vaccines used today are: Pedvaxhib, Trihibit, Acthib, Omnihib, and Comvax. Some are individual vaccines, while others are combination vaccines. The numbers of pre hib vaccine cases are made up. Hib was not nationally notifiable until several years after the vaccine had been licensed, so they really have no idea how many hib cases there were prior to the vaccine. Not only are the 20,000 cases unverifiable, even by date as no date is given, but when Hib become notifiable in 1991, they didn’t break the incidences down by age. They also go from saying children, in the VIS, to saying ‘cases’, in the Pink Book. How many of those “cases” were children? Hib being the biggest cause of deaths prior to the vaccine is also a guess. If the disease wasn’t notifiable, and before they even figured out what Hib was, how can that statement have any accuracy? They would have had to test every permutation of Hib infection or septic death to know for sure that it was Hib. Unfortunately, children are at a greater risk of getting Hib disease right after vaccination. Studies from Science News warned of increased susceptibility to the disease during the first 7 days after vaccination. Even the AAP has warned doctors to look for signs of the disease following vaccination (AAP policy statement). Several studies found that Hib vaccinated children are up to 6 times more likely than non Hib vaccinated children to contract Hib during the first week following vaccination. (Pediatric Infectious Disease Journal and JAMA). In another study, children who got Hib 3 weeks after their vaccination, 70% developed Meningitis. Additional research shows that antibody levels will decline rather than increase following Hib vaccination. Stay tuned for more on HIB later….